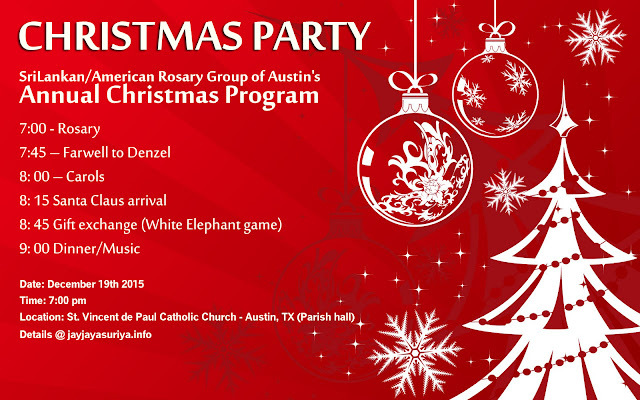 This year our Christmas rosary will be held at St Vincent de Paul church’s parish hall, and to celebrate Denzel’s farewell. Appreciate if all Fatima Group members could attend the Saturday 5:00 pm mass at St Vincent de Paul church, will help us start the rosary on time, (volunteers are welcome to decorate the hall Saturday morning around 10:00 am). Please email or Call Kumari/Raju 512-919-6960, or Leroy 512-996-9937 to confirm the dish that you plan to bring (estimated number on participants are around 80 packs - including Fatima group members), understand, it’s hard to cook for 80 but let us know what you bring to plan the quantity. Please bring a gift wrapped (could be an ornament / some home or kitchen item) price range under $20.00, PLESE DO NOT WRITE ANY NAMES. Also if you wish to bring a gift for you child make sure to write your child’s name on it, Santa can give it. If you have any invitees feel free to invite but you will need to inform Leroy/vino or Raju/Kumari before December 10th 2015. Below is the tentative program, Please feel free to share your comments and ideas to finalize the program. *If you haven't told us what you are bringing, let us know via e-mail as soon as possible. SriLankan/American Rosary Group of Austin on facebook.